IND.01. 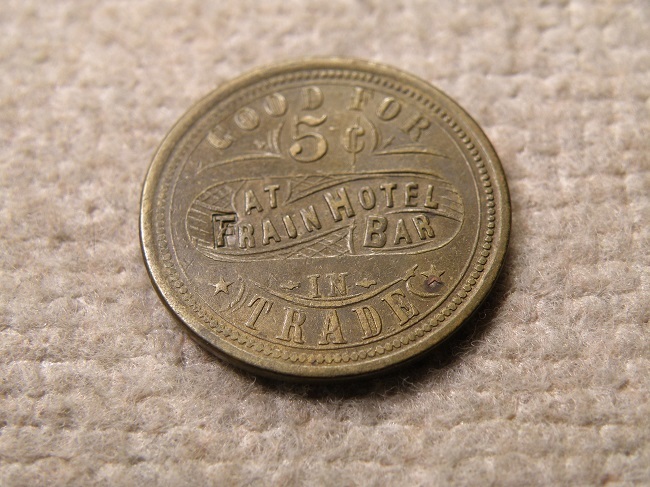 An attractive Indiana token in nice condition. Home/Bakery/Bedford/Ind.//Good For/cts.5 cts./In Trade. Oct, Aluminum and measures 26mm. IND.06. An attractive maverick Indiana token in nice condition. E.R & Co./5/cents//e.r. & co./5/cents. Round, Brass and measures 24mm. IND.02. An attractive Indiana token in nice condition. Hy-Way/Cigar/Store/Daleville, Ind.//Good For/5¢/In Trade. Round, Zinc and measures 24mm. IND.171. An attractive maverick Indiana token in nice condition. A. Denk//Good for/5¢/At Bar. The token is round, made of brass and measures 24mm. IND.08. An attractive Indiana token in nice condition. Koehler/&/Schafer//Good For/5¢/In Trade. Round, Brass and measures 21mm.